Lately, we have got a lot of queries like this from our readers who wish to transfer their data from one smartphone to another. Unlike Android to Android or iOS to iOS transfer, it can be a bit tedious to move your data from an iPhone to Android. The good news is that there are readily available tools out there that can help you do the same. 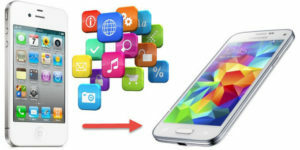 In this guide, we will make you familiar with the top solution to perform a direct iPhone to Samsung transfer with a single click. One of the quickest ways to transfer your data from one device to another is by using dr.fone – Switch. It is a part of the dr.fone toolkit and provides a user-friendly solution to perform a direct device-to-device transfer. 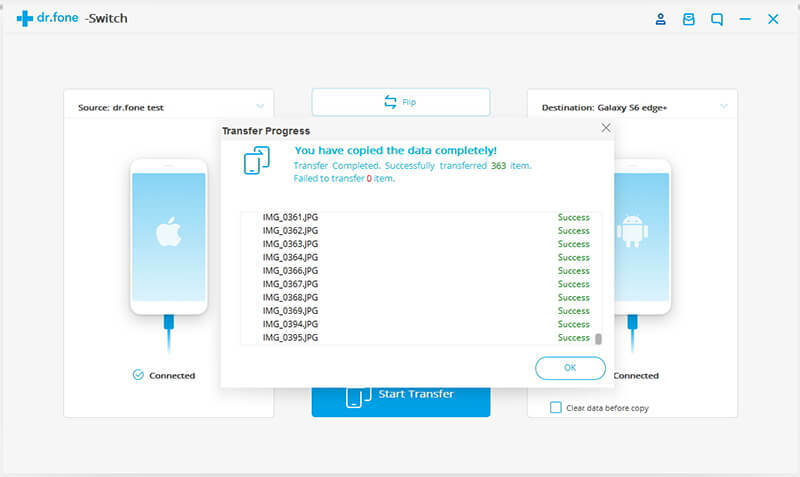 Since it supports all the leading Android and iOS devices, you can easily perform a cross-platform transfer of data. With just one click, you can transfer all your data. It is extremely secure to use dr.fone – Switch. Your data won’t be accessed in the process and will be kept private. The tool can be used to transfer data between Android and Android, iOS and iOS, and even iOS and Android. It is compatible with all the leading iPhone generations and different versions of the Samsung devices. It supports all the major data types such as photos, music, contacts, messages, videos, and so on. It has an extremely user-friendly interface and does not require any prior technical experience. There is no need to root or jailbreak the device to use the application. 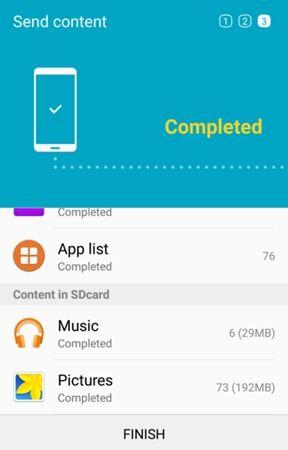 All of this makes dr.fone – Switch one of the best file transfer software for iPhone to Samsung transfer. Read on to learn how to use this tool in detail. How to perform iPhone to Samsung transfer with dr.fone – Switch? To start with, download dr.fone – Switch on your Mac or Windows PC. Once you launch the dr.fone toolkit, you would have to pick the “Switch” module to get things started. 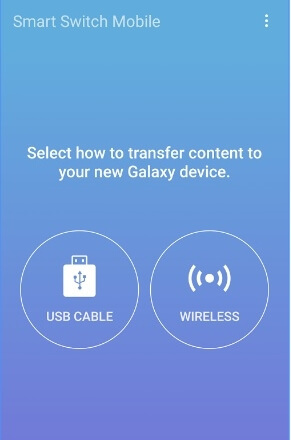 Connect your iPhone and the new Samsung device to start the process. In no time, both the devices will automatically be detected by the application. To transfer data from iPhone to Samsung, the source device should be iPhone while the target device should be Samsung. You can click on the Flip button to interchange their positions. From the provided options, select the type of data you wish to transfer. You can select photos, videos, music, contacts, and so on. After making the appropriate selections, click on the “Start Transfer” button. Sit back and wait as the application will complete the iPhone to Samsung transfer. Just make sure that both the devices stay connected to the system as the transfer process will take place. In the end, you will be notified once the process is completed so that you can remove your devices safely. 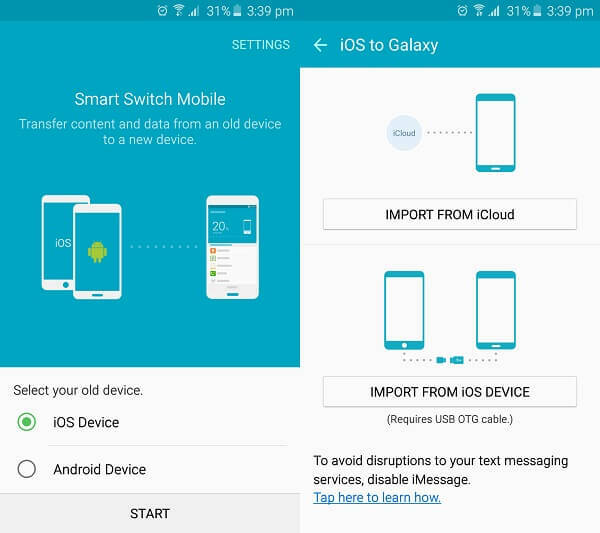 Samsung has also developed a special tool, Smart Switch, to help its users move their data from another device to a Samsung phone. If you want, you can give it a try to perform iPhone to Samsung transfer as well. 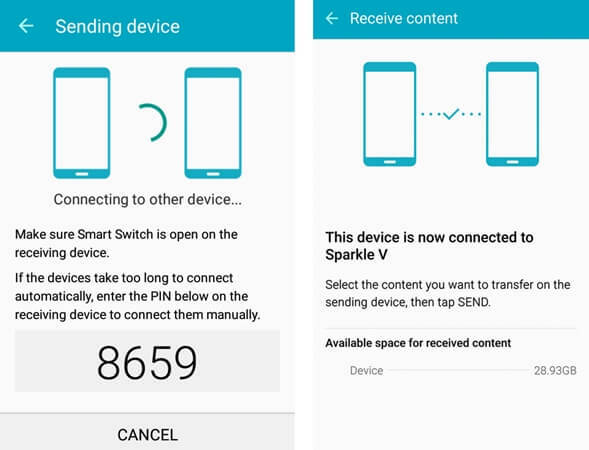 Firstly, install the Samsung Smart Switch app on both the devices. Launch it and choose the mode of transfer – USB cable or wireless. If you choose wireless then both the devices should be connected to the same Wifi network. On the new Samsung phone, you need to specify the platform of the source device, which is iOS, in this case. Later, you have to select whether you are importing data from the device storage or iCloud. A unique one-time password will be displayed on your iPhone. Match this with your Samsung phone to verify the connection. Wait for a while as both the devices would be connected. Once a secure connection is established, you will be notified. Now, just select the type of data you wish to transfer and initiate the process. After a while, the transfer will be completed successfully. Ideally, both dr.fone – Switch and Samsung Smart Switch can be used to perform an iPhone to Samsung transfer. Though, if you are looking for a more hassle-free and quick method, then dr.fone – Switch would be recommended. Samsung Smart Switch often gives unwanted complications and compatibility issues. Too many times, users are not able to connect both the devices as well. Needless to say, it is a more complicated process and is only restricted to Samsung devices. On the other hand, dr.fone – Switch provides an extremely user-friendly solution. You can transfer all your data with just one click and that too in minutes. The tool can further be used to transfer data between different platforms. Besides Samsung and iPhone, it is compatible with devices manufactured by brands like Lenovo, HTC, LG, Sony, Huawei, etc. Go ahead and download dr.fone – Switch to perform a direct iPhone to Samsung transfer. Since it is compatible with the latest devices like iPhone 8, iPhone X, Samsung S9, Note 9, and more, you can use it to switch to S9 and other devices too. 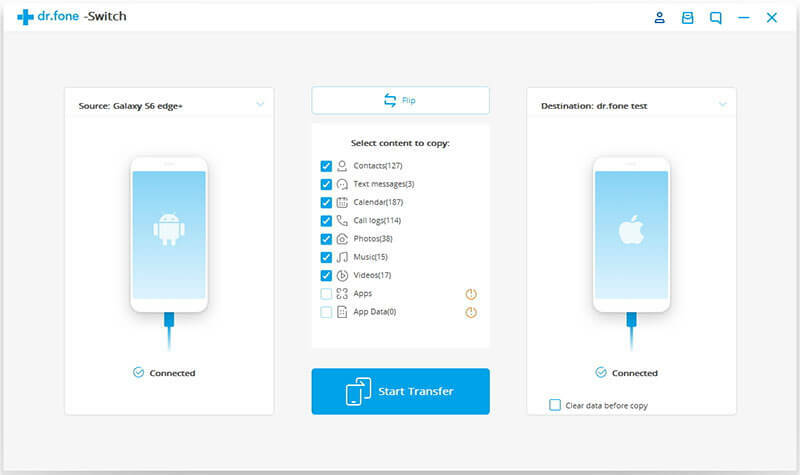 Now when you know how to perform iPhone to Samsung transfer, you can share this guide with your friends as well to teach them the same.